When I first held Sugar in hand, I was surprised by how heavy she felt – heavy for a bird of that size (think of Shikra found in the Indian subcontinent). She was a Gyr – Saker falcon hybrid, being trained by Robin. That was six years ago. Since then, I’ve been infatuated with falconry, an ancient form of art where man and bird become one. I don’t call it domestication – the bird that sits on the hand of his or her trainer is not domesticated – it is a rare form of art where a wild bird bonds with a human but remains wild in its heart. 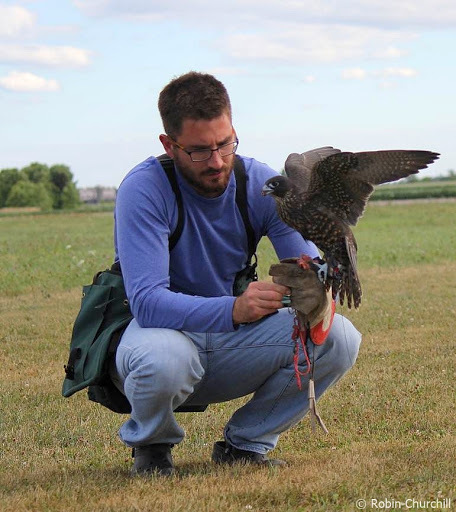 As a modern-day falconer, Robin helps chase bird populations which are a menace and a hazard in industrial environs, and falcons are the ultimate weapons – far more efficient than using guns – to keep them away.